putting together some hexagon blocks that aren't my style (from my mother in law) but have come together Ok - I'll post once I've done some quilting on them. But for today I'm pretty happy with the progress I'm making on my scrap jars quilt. I knew the stars would stand out for themselves because of their colour, so I wanted to quilt in the negative spaces, but how to do that? 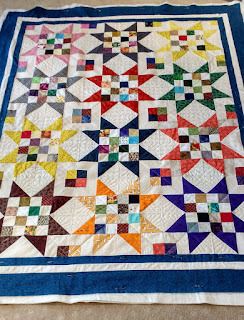 I also tend to use my scrap quilts as a place to practice some free-motion quilting that I haven't done before, so here I thought I'd try match-stick quilting. I liked the corners of the block where the four colours came together and so thought I'd give that a go. I'm pretty happy with the result, but not quite sure that the location I chose to do it was necessarily the best. In the other squares where the star points came together, the quilting I've done has tended to keep the four triangles apparent, rather than making it one whole square. Not sure that I'd do that next time either but I enjoyed doing the six 'finger' type arrangement. 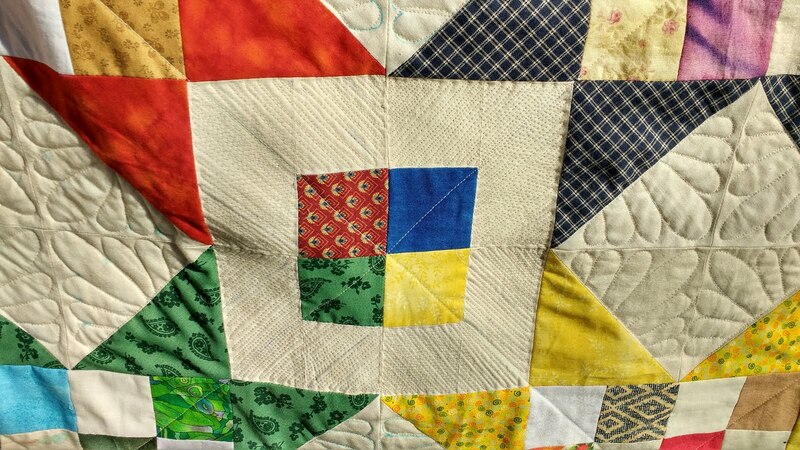 I've also done a little bit of quilting in the cream border between the blue ones. So now, on to complete those fingers and those match stick bits on the edge and then binding - hurrah. I'm enjoying this but as is often the case, there are others coming along that I'm keen to get to as well. But this is a great way to use up scraps and kind of put me in the mood for more 2 and half inch squares, crazy I know but they do look effective as a postage stamp - but that's for next time! I like how your quilting creates a play of different textures in addition to the play of different colors. I can see what you mean by separate triangles being apparent rather than the whole squares, but in the big picture it's really not a problem. Wish you a speedy finish! Thanks Lena, hoping for a finish within the next week as I want to gift it to some friends. I love those scrappy stars and your setting is wonderful! Thanks Vicki, they were quite addictive and fun! Kove the stars! It looks so bright and happy. 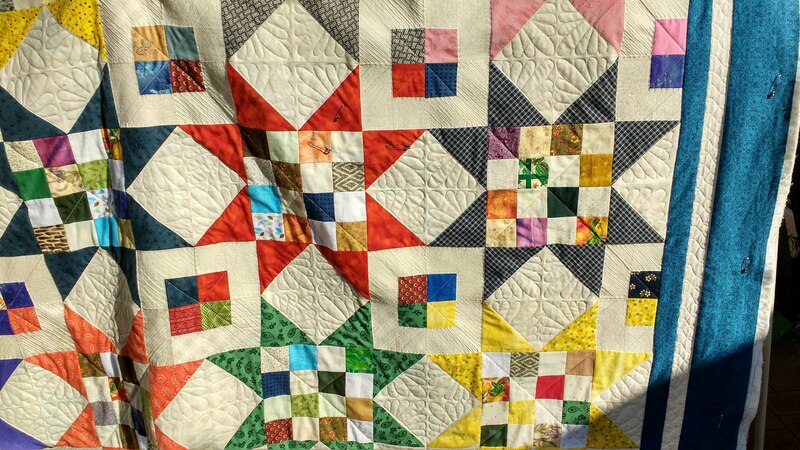 The quilting is very nice! And what a lucky friend to have that great bag! Thanks Mari, she was pretty pleased with it I have to say. Love the little bag looking all sunny and happy and your quilting in the negative space with the FMQ looks great, too! Thanks Vic, free motion quilting is such fun! 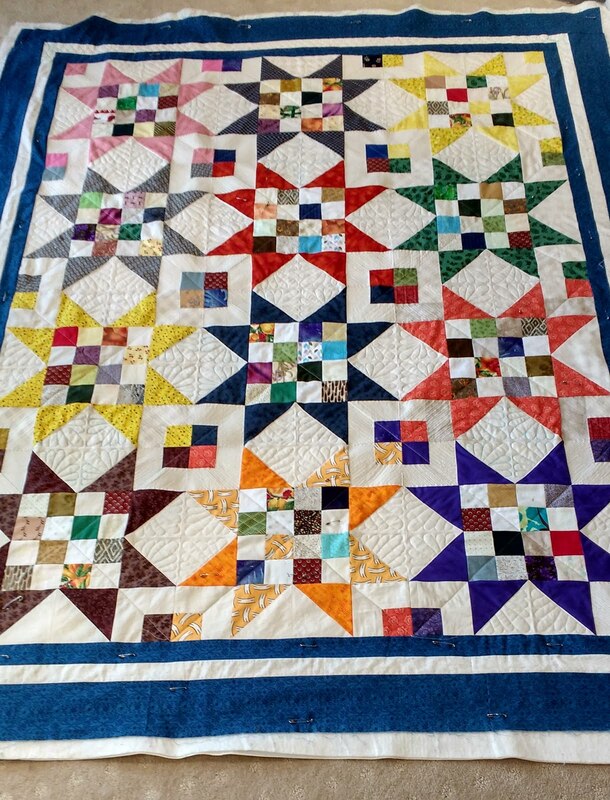 Beautiful quilting, Lynn! It really enhances your quilt. Whoop whoop!! Thanks Sarah, busy cutting out some 3 and half inch squares now like your bow-tie quilt from March- I do like scrappy quilts! 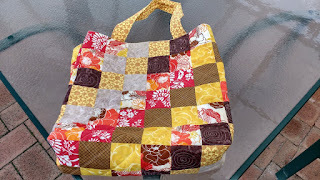 I think you nailed your "practice" quilting Lynn! Love the matchstick as well as the fingers, and the ribbon candy in the white narrow border is terrific! Will be watching to see what you do with the blue borders. You make me want to make one of these...I've built up a bunch more 2.5" squares since I did the last quilt with them.